Download the latest Raspbian disk image from here. Unzip the .img file from the downloaded zip file. Insert a SD card of at least 4GB capacity into your computer. Write the downloaded disk image to it, as described here. Insert this SD card into the Pi board. Connect your Pi and your home wireless router with a Ethernet cable. Power on the Pi. Go to the Admin webpage of your wireless router and figure out what IP address has been assigned to your Pi. Let us assume it is assigned 192.168.0.99. SSH into your Pi using the command ssh pi@192.168.0.99. The default password is raspberry. 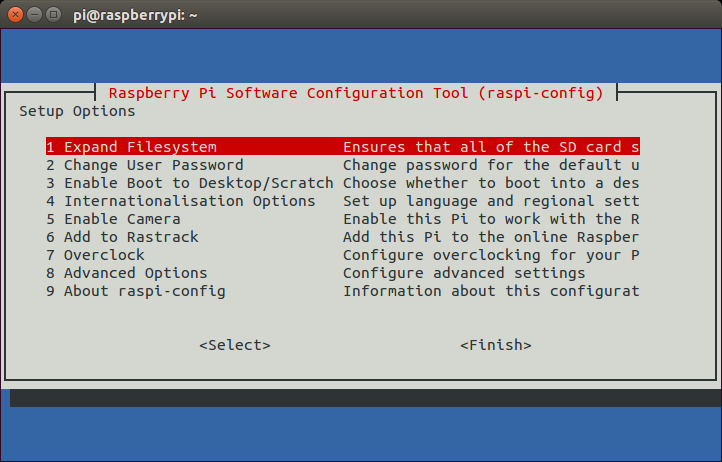 Run sudo raspi-config and choose to Expand filesystem. This expands Raspbian to make full use of the space on your SD card. Exit the config tool and choose to reboot when it requests so.